c-rex.net IDS helps you to satisfy your customers' needs. Deliver the formats and languages your customers require. The deep integration of c-rex.net DTS makes this as easy as possible. ­► Provide information ­► client requests­ ► c-rex.net delivers. c-rex.net IDS is born in and for the Cloud. Providing technical information for smart factories, smart homes, IoT is only possible via the cloud. In the end this means that any service, client or app can be connected to your data. Supported by taxonomies and ontologies they get only the information they need in their specific situation. At any time you have full access to YOUR data stored in c-rex.net IDS Storage. Easily download YOUR full packages with one click or automate system migration with simple API calls! It is part of our mission to give you back the ownership of YOUR content. Simply move to other systems if you are not satisfied or if you think another system does a better job. The easiest way to work with c-rex.net IDS is using the integrated storage. The Internet gives us so many possibilities to optimize and automate #techcomm processes which are time-consuming, expensive or just plain annyoing. Let us know how c-rex.net can support you and your customers to switch to Information 4.0. Great if you are using XML technologies for creating your content. This way you can get the most out of structured information. If your publishing system is able to generate RDF packages, simply publish your content to c-rex.net IDS using the Package API. Otherwise upload your content (i.e. DITA XML) and c-rex.net IDS will create an RDF Package for you. The integration of supplier documentation has traditionally been a mess. c-rex.net IDS offers you a great solution for this - no integration needed. You merely have to link to the content somewhere in the web or within c-rex.net IDS storage. If you are a supplier yourself, publish your content to c-rex.net IDS and provide a link for your customers, so that they are able to integrate your content, howsoever they like. c-rex.net IDS is able to handle your unstructured content (i.e. Microsoft Word documents). Simply upload your content and c-rex.net DTS will do the rest. c-rex.net DTS analyses your content, extracts metadata and creates formats, like DITA XML, HTML, Markdown and others.The extraction process can be configured to get the best result possible. Move the way to publish structured content without working with XML directly. Customers' control systems need your technical information in order to give your customer the best-possible user experience. Control systems only need to implement a simple REST API call in order to bring up the matching content for any given situation onto their devices. The most popular usecase, of course, is to request or to publish data via API calls. However, we know, it's not always possible to deliver or update content automatically. For such cases c-rex.net IDS management console provides full access to your published data. Besides uploading and downloading content to the system, you can add and edit metadata manually. 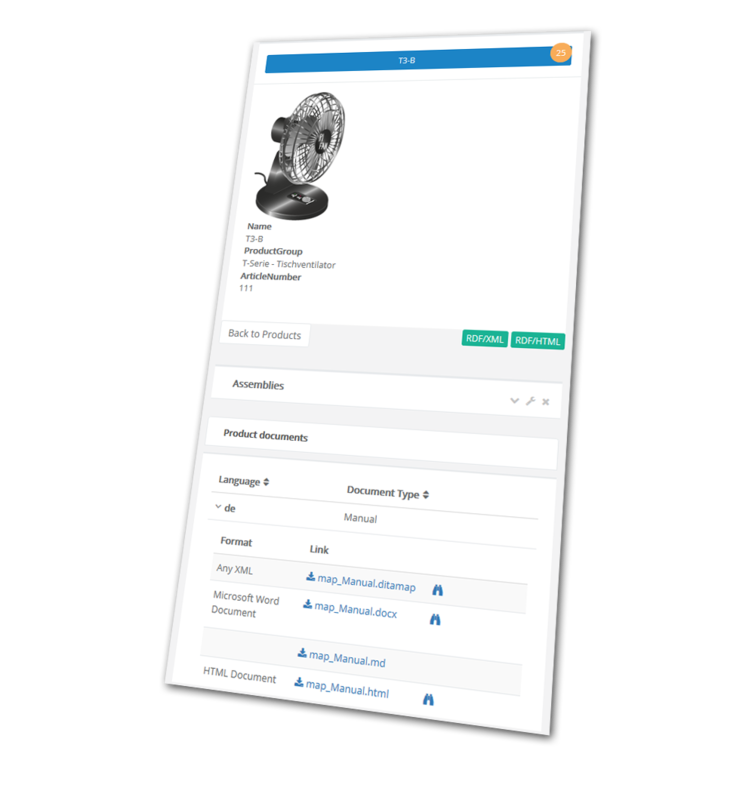 You are also able to add or change images of your products and components. Only take care of your products - no knowledge of RDF and other technical stuff needed. In order to meet your customers' requirements for getting formats and languages that they request, it is necessary to have a very powerful and flexible information extraction and publishing tool. And here crex.net DTS comes in. It converts any uploads from XML over InDesign, FrameMaker as well as Word and many others to the format required. If a client requested a document in a language that has not yet been translated, crex.net DTS uses machine translation tools in order to provide translated documents on demand. Information is stored and transported in different formats. c-rex.net focusses on information, so formats don't matter anymore. Of course XML is the best format for data exchance, but if your format is Word, Excel, FrameMaker or any other proprietary format this does not prevent you being part of Information 4.0.
c-rex.net analyses your content, extracts metadata and publishes it to the web in the format your customers require. Topics are extracted and enriched with metadata provided explicitly or implicitly. Information 4.0 means to give humans access to the right information at any time in a specific situation. Last consequence is that control systems, machines, apps and any devices have to bring up information units to the user right before the user needs it. So these systems request information via c-rex.net IDS's powerful REST-API. c-rex.net IDS supports the ontology based on the W3C RDF Standard. Give your customers access to your documentation including complete RDF metadata access. Let them create individual data queries to receive only the content they require. c-rex.net IDS SPARQL interface provides infinite possibilities for creating individual queries for your technical information. We are very happy and thankful to Zwick GmbH & Co. KG for providing technical product information of ZwickiLine 500 N for demonstration purposes. Documentation is managed and published by a Component Content Management System (CCMS). See how XML based technical information can be used to provide modular content to machines and any kind of apps. We built a Windows 10 Demo App to illustrate the usecase of c-rex.net IDS. It demonstrates a fictitious control system in a smart factory. See how a booker is able to take control over all his machines in his smart factory. In case of an incident, he receives a notification including all situtation-based information. The user then is able to schedule fixes or repairs and assign it to a service management system*). If maintenance is necessary, the maintainance task information retreived from the technical documentation and a task, including all related content like circuit diagrams and drawings will be assigned. PI-Fan is a sample product line including 18 products. 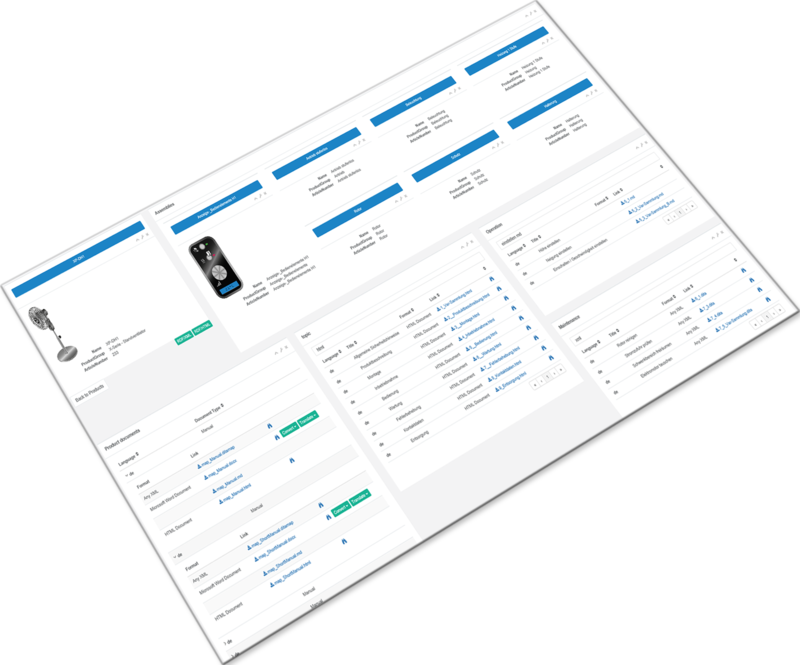 Each product and each information unit is directly accessible by the REST API. Documentation units contain 1 to n languages and 1 to n formats. Get access to dedicated maintenance tasks, troubleshooting descriptions, technical data and operation tasks. RDF metadata are extracted from Microsoft Excel sheets and even from Microsoft Word content. Word documents are converted to DITA XML, PI-Mod , HTML, Markdown, PDF and in a roundtripping process back to Microsoft Word. The Web focusses on APIs. So c-rex.net IDS does that as well! Make use of our powerful information framework. You're only limited by your imagination! If you are a web developer, you will love our RESTful API. Get direct access to resources and work with JSON objects, as you are used to do. If you are familiar with RDF technology, you will probably like to have full access to RDF resources. Use SPARQL to create your own data query and make use of this powerful Semantic Web technology.